HOUSTON, March 16, 2018 /PRNewswire/ -- LyondellBasell (NYSE: LYB), one of the largest plastics, chemicals and refining companies in the world, through a grant to The Global FoodBanking Network (GFN), made it possible for three members of the Food Security Foundation India (India FoodBanking Network) to participate in the 12th annual H-E-B / GFN Food Bank Leadership Institute held March 12-15, 2018, in Houston, Texas. 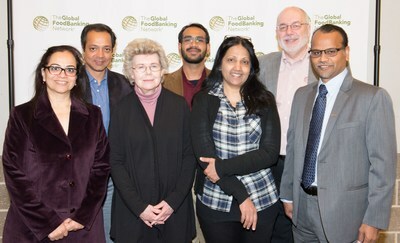 Organized annually by The Global FoodBanking Network, the 2018 Food Bank Leadership Institute brought together food bank leaders and hunger champions from 33 countries to discuss key topics such as designing effective supply chain and inventory management, collecting data and measuring impact, advancing nutrition and strengthening food banks' capacity to serve those in need. LyondellBasell products play an important role in the freshness and safety of food across the globe. The company's plastic resins are used to create protective film, seal-and-peel packaging and other products that enhance food shelf-life and convenience, and improve safety during transport and storage. "Hunger is one of the greatest challenges our world faces; in addition to supporting food banks in the communities where we operate, LyondellBasell continuously collaborates with our food packaging customers to develop innovative solutions that reduce food waste and improve distribution," said LyondellBasell Associate Director, Polymers Business Development and Projects, Ganesh Nagarajan, who most recently lead PP compounding operations in India. "We are very pleased to support The Global FoodBanking Network in their mission to create sustainable food banks." According to the India FoodBanking Network, India is home to the largest undernourished population in the world. Over 190 million people go hungry every day and one in four children are malnourished. The organization's CEO Vandana Singh and website manager Himanshu Thakur along with Pankaj Mahajan, a member of the board of directors, traveled to Houston to attend the Food Bank Leadership Institute. "We are grateful to LyondellBasell for sponsoring the GFN Food Bank Leadership Institute and providing this opportunity for our delegation to learn best-practices so that we can achieve the highest standard of operational excellence as we work to expand our services and meet a critical need in India," said Singh. LyondellBasell focuses its global philanthropic efforts in the areas of education, health, environment and providing support for first responders. The company actively supports many organizations in the communities where it operates, including the Houston Food Bank, the world's largest food bank, where Jim Guilfoyle, senior vice president of Global Intermediates & Derivatives and Global Supply Chain, serves on the board of directors. LyondellBasell operates three polypropylene compounding sites in India and has a sales and technology center in Mumbai.